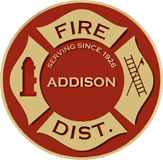 The Addison Fire Protection District provides a wide variety of community programs designed to keep our community safe, healthy and well informed. The programs contained on this page are designed to promote fire, medical & life safety throughout the district we serve. If you have any questions about our current programs or if you should have any ideas for any future community programs, we would love to hear your ideas. Additionally, if you have any ideas on ways the Addison Fire Protection District can partner with other organizations to help & support the community we serve, we’d love to hear those ideas as well. Feel free to call the administrative offices at our headquarters fire station (10 South Addison Road) (630) 628-3100 with your questions and/or ideas or you can email them to admin@addisonfire.org.